Real estate professionals have relationships with thousands of homeowners. Learn how you can be a part of their relationship marketing by providing exclusive offers to their past customers and sphere of influence. First of all, it really is free. 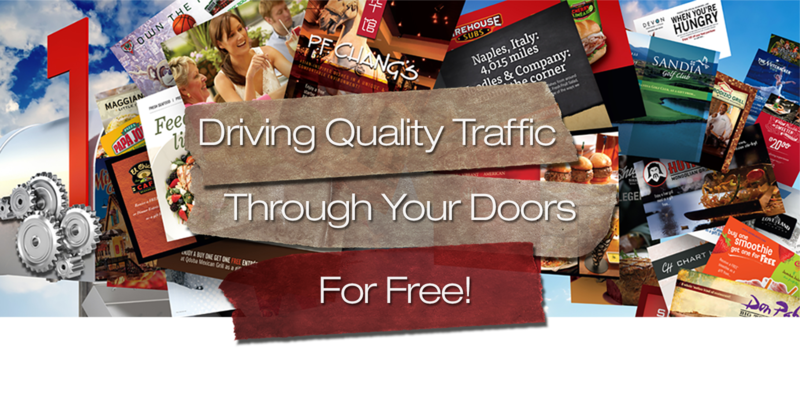 But there are tons of other reasons why From Your Friends postcards are one of the best ways to promote your restaurant, store or attraction and drive quality traffic through your doors. Since 2002, From Your Friends has worked with thousands of local and national restaurants and venues, providing more than $10 million dollars in free direct mail marketing for our featured partners. Give us your info and we'll send you a package complete with brochures, samples, demographic stats, maps, fairy dust, unicorn smiles and puppy hugs. 866-866-0078 (This is free, too). © Braintree Marketing, Inc. 2002-2019. Imitation is the sincerest form of flattery. Plagiarism is just being lazy. You know who you are.